It is said that the most personal artwork becomes universal. Often depicting the artist’s intimate family life, the photographs of Bea Nettles also speak to broader ideas of motherhood, teaching and what it means to be an artist. Featuring works from her most seminal series of photographs, String of Hearts, on view March 10 – July 8, spans nearly thirty years of the artist’s significant career. “Once I had my first child,” Nettles states, “I was connected to history.” It is her exploration of parental responsibility and inventive use of autobiographical images that are the focus of this exhibition in the Fred and Laura Ruth Bidwell Gallery at the Akron Art Museum. While Nettles is celebrated for her metaphoric views of domesticity, it is her experimental processes that animate her themes. She is among a group of pioneering artists who in the late 1960s and early 70s began inventing alternative photographic techniques to explore aspects of their emotional life in a symbolic rather than documentary manner. A leader of the handwork movement, Nettles augments her photographs with applied color, stitching, textiles and text. She is also known for her bookmaking. Through teaching and numerous publications including Breaking the Rules: A Photo Media Cookbook in 1977, Nettles’s innovative use of photographic imagery and processes have influenced generations of photographers. 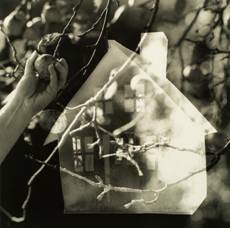 Apple House, from the Complexities series, uses multiple negatives to create allusions to home, dreams and the biblical Eve. Also included in the exhibition are works made from Polaroids, etchings, digital and dye transfer prints. String of Hearts is drawn exclusively from the collection of the Akron Art Museum, which owns a cross-section of Nettles’s work thanks to generous donations by the artist. A native of Florida, Nettles received her bachelor’s degree in painting from the University of Florida. She received her master’s in photography from the University of Illinois in Champaign-Urbana and in 1970 began teaching in Rochester, New York. In 1984 she returned to the University of Illinois, where she began her tenure as chair of the photography department until her recent retirement after 38 years of teaching. Nettles was one of the artists featured in the Akron Art Museum’s national touring exhibition, A History of Women Photographers, in the mid 1990s. Bea Nettles has been exhibiting and publishing her autobiographical photographs and artist’s books beginning in 1970. Since that time, she has had more than 50 one-person exhibitions including the International Museum of Photography at the George Eastman House, the Museum of Contemporary Photography in Chicago, Light Gallery and Witkin Gallery in New York City. This lecture is free to the public, but reservations are required to guarantee seating. Register online at AkronArtMuseum.org. This exhibition was organized by the Akron Art Museum and made possible by a generous bequest from George and Peg Seeley. This entry was posted in akron, Art News, arts, canton, exhibits, galleries, museums, ohio, photography, shows and tagged akron, akron art museum, art, art news, creative, dye transfer prints, exhibit, exhibition, gallery, intimate family life, museum, personal artwork, photographic imagery, seminal series, show, string of hearts. Bookmark the permalink.